Durham Monthly Meeting of Friends convened in worship on Sunday, October 15, 2017 with 23 people present. Clerk Sarah Sprogell recalled some of the messages brought during worship this morning, which help us prepare inwardly for today’s meeting. Sarah expressed appreciation for everyone’s presence. 1. Sarah Sprogell read minutes #1 and #2 from the July 16 Meeting for Business which presented the results from the surveys and listening session regarding the meeting’s experience as a semi-programed meeting without a pastor. 2. 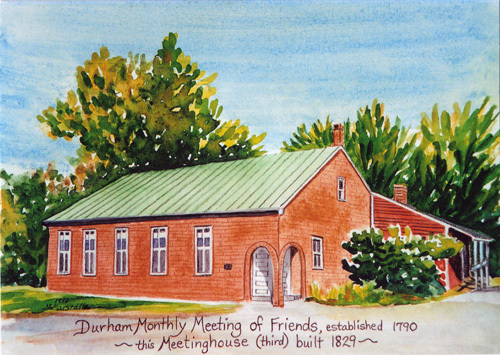 Ron Turcotte read the recommendation of Ministry and Counsel that Durham Meeting continue as a semi-programed meeting without a pastor, and that a committee be formed to look in the possibility of a stipend position for unmet needs. A discussion of deep sharing and consideration of important needs followed Ron’s report. 4. Monthly Meeting appointed Doug Bennett, Sukie Rice, Martha Hinshaw Sheldon and Jo-an Jacobus for the ad hoc committee to develop a stipend position. Joyce Gibson will be asked if she wishes to join this group as well. 5. Reports from the Youth Minister and Christian Education were read. a) Christian Education celebrated World Quaker Day on October 1.
b) On October 15, several youth and adults went to Passadumkeag for the Wabanaki Fall Festival to support our Maine indigenous community. c) October 30 there will be a Harvest-Halloween party. d) Our childcare worker will be absent during October and most of November. Others with background checks are being asked to help. e) Christian Ed recommends Saturday, December 16 for the Christmas program. They are developing ideas for Advent and how to mark this season. 6. The Youth Minister and Christian Education reports were accepted, and approval was given for the dates of October 30th for the Harvest-Halloween party and December 16 for the Christmas program. 7. Trustees corrected the September Monthly meeting minute for Trustees. Item #7a, line 9 should read “Money received for the purchase of plots as well as for perpetual care goes into the cemetery fund held by Trustees. “This I believe” will become a featured article again, with David Dexter overseeing it. 9. The meeting approved that Woman’s Society collect donations for the Kickapoo Friends Center during the month of November. 10. Sukie Rice brought the Finance Report for January 1-September 30, 2017. Revenue for the Operating Account was $37,304 (69% of our budgeted amount for the year). Expenses were $28,892 (61% of the budgeted amount). The balance for the General Fund is $28,414 and the balance for the Capital account is $5617. The report was approved with much appreciation for the good financial condition we are in this year. Committees are asked to communicate with Finance Committee about their needs for the 2018 Budget. 11. The Woodbury Fund is currently in a bank CD, coming due at the end of October. The meeting approved that the money be taken out of CD when it matures and put into a new savings account. At that time Finance Committee can look into alternatives to a CD for the Woodbury Fund. 12. The meeting adjourned in the Spirit at 2:50.